A recent Google report uncovered how travelers turn to the web early on in the travel process. The Internet is the primary source of travel inspiration, and over 65% of leisure and business travelers research online before they decided where and how they would travel. More than ever before, only accommodation providers with a strong online presence will engage these web-savvy travelers. For local businesses in the hospitality and tourism industry, this presents a major challenge in knowing where to start with their digital marketing efforts. Thankfully, we now have some help. Through a partnership between M&D Web Creations and Hotel Links Solutions, small to medium sized hotels, guests houses, condotels, and villas in Guam can now benefit from a variety of digital marketing solutions aimed at enhancing their online presence and increasing online sales and bookings. "We first partnered with Hotel Links Solutions to offer digital marketing products and services to accommodation providers in Palau, as part of a special program sponsored by the South Pacific Tourism Organization (SPTO) and Pacific Island Trade & Invest (Pt&I)," said Denise Ajimine, owner of M&D Web Creations. "It was exciting to see smaller sized accommodation providers in Palau have access to fully-functional websites and a powerful online system that were previously only available to larger hotels." M&D Web Creations continues to work with many accommodation providers in Palau but are now offering the suite of Hotel Link Solutions products to Guam's local businesses. "Guam is a very popular tourist destination, and we don't want small to medium size accommodation providers to miss out from the online travel market. This is an affordable marketing solution that will help them to optimize both revenue and profitability by increasing their online efforts to secure direct bookings with sales," says Ajimine. The Hotel Links Solutions system is very powerful and allows accommodation providers with the power to select only the solutions they need for their property. There are dozens of combinations possible. Maybe a property wants to keep their existing website but update to the latest booking and distribution tools, or create a new website with a booking engine and channel manager. For more detailed information, view our complete list of digital marketing solutions. Not sure what you need or where to start? Some accommodation providers think that once they have a website and a booking engine, they should be doing fine, only to discover there’s been no improvement in bookings at all. This makes it very difficult to know what to do next. Is it a new website which is needed, or a new booking engine, or are there other things I should spend my money doing?. 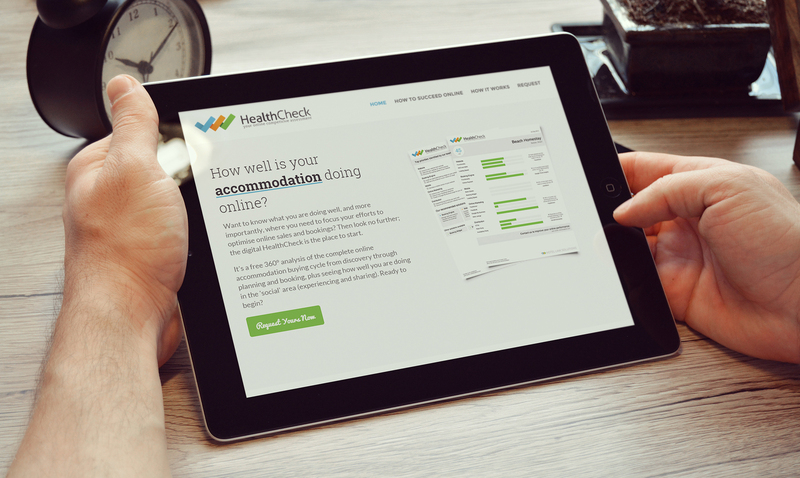 A great place to start is the digital Health Check. It's a free and comprehensive analysis of the complete online accommodation buying cycle from discovery through planning and booking, plus seeing how well you are doing in the 'social' area (experiencing and sharing). This digital Health Check is part of the suite of digital solutions that M&D Web Creations offers to local businesses in the hospitality and tourism industry in Guam. Request your digital Health Check now. Or for more information, contact us directly.